Luxury in Motion is a premium, chauffeur-driven wedding car hire service. We provide professional chauffeurs on your wedding day and have a wide range of modern and vintage luxury vehicles available for wedding car hire. We primarily serve Berkshire, London and the following counties: Surrey, Hampshire, Sussex and Buckinghamshire. Our fleet includes prestige car marques such as the Bentley Mulsanne and Rolls-Royce Phantom. If you have a more bespoke request, we can also source vehicles of a more unique nature. To reflect the nature of the wedding market, we offer discounts for wedding car hire on weekdays, or during the winter months and can also organise transport home for your evening wedding guests, or airport transfers for your honeymoon. Luxury in Motion at the Four Seasons Hotel, Hampshire providing a fleet of luxury, chauffeur-driven Range Rover and Land Rover wedding vehicles. Our chauffeur-driven Land Rover Discovery Sport HSE is a perfect support vehicle to transport family members, Bridesmaids, or the Groom's party. For weddings it can carry up to 6 passengers as the vehicle features two additional fold-up seats in the boot area suitable for children. This can often mean avoiding the cost of booking a further vehicle. We can also supply child booster seats should you need them. The vehicle features leather upholstery and a full-length panoramic roof. It is also available for hire and licensed for honeymoon airport transfers, or to transport your family and guests home from your evening celebrations. On the big day, your vehicle will arrive in immaculate condition and dressed with your choice of white, or coloured ribbons. Our chauffeurs will also be immaculately dressed and do everything they can to help make your day as enjoyable as possible. As a thank you we also include a complimentary bottle of bubbly to help you celebrate. We offer wedding car hire for all cultures and types of wedding celebrations. All our wedding car hire packages include a free bottle of bubbly and car ribbons, as well as 50 miles of travel from our base. Wedding vehicles are typically hired for between 1-4 hours, but are also available for a full day's hire. Wedding Package 1: 1 hour hire, free bottle of bubbly, car ribbons, mineral water and 50 miles of travel from base included. Wedding Package 2: 2 hour hire, free bottle of bubbly, car ribbons, mineral water and 50 miles of travel from base included. Wedding Package 3: 3 hour hire, free bottle of bubbly, car ribbons, mineral water and 50 miles of travel from base included. Wedding Package 4: 4 hour hire, free bottle of bubbly, car ribbons, mineral water and 50 miles of travel from base included. For a no obligation quote, please call us, or click on the image below to request a quote by email. It is more cost-effective and becoming increasingly popular to organise a wedding in the winter months, so between October and April we offer a 10% discount on all our wedding packages. You will also find more favourable rates relating to wedding costs on weekdays, so we also apply a 10% discount to any bookings made Monday to Friday. For any multiple bookings we gratefully receive (for example a vehicle booked during the wedding day, evening celebration and for a honeymoon airport transfer), as thank you for your business we will also apply a further discount. Please note: for any additional vehicles booked through third-party operators, this discount will be subject to negotiation which we will conduct on your behalf. Organising and planning a wedding can be a time-consuming task. When you are considering vehicles for a wedding, a number of considerations will come into play. Whether you need a lead vehicle for the Bride, support vehicles for the family, Bridesmaids or Groom's party, vehicles for guests to get home from the evening venue, or for honeymoon airport transfers. To help alleviate the stress of organising wedding transport, we offer our wedding car sourcing service. We will take a brief from you, source and recommend vehicles and handle bookings and itineraries on your behalf. Throughout the process, we will work closely with either yourselves, or your wedding planner to ensure everything runs smoothly. We source and book a variety of modern wedding vehicles on your behalf including luxury car brands such as; Land Rover, Range Rover, Bentley, Mercedes-Benz and Rolls-Royce. 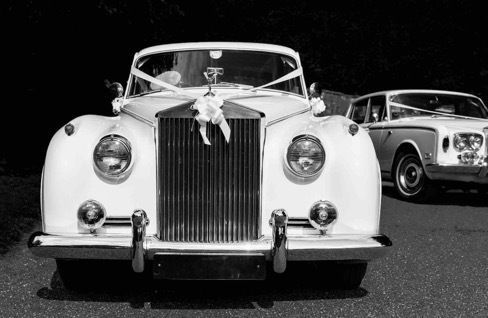 We source and book a variety of classic, or vintage wedding vehicles and limousines on your behalf, including classic car brands such as; Rolls-royce, Mercedes-Benz, Bentley, Austin, Daimler, Buick and Beauford. Our chauffeur-driven wedding car service is available across the South Easy in Surrey, Berkshire, West Sussex, Buckinghamshire and central London. We provide chauffeur services for weddings, to large corporate firms, corporate events, executives, all major airports and transportation hubs in the south east - including; St Pancras International, London Heathrow, Gatwick, Stansted, Luton, London City and Farnborough airports. Luxury in Motion. A prestige chauffeur service in Surrey and London. Click to see our latest news, offers and Client testimonials.